Describing taste with words? Definitely a challenge, especially with something that it is as delicious as red velvet cake. Some would say it’s cheesy, some chocolaty, and others fruity. It's a kind of explosion of different, soft flavors with red colored batter. For sure it’s all about chocolate, but a colored cake base layer can also give a bit of a “spicy” flavor. Someone would say that it is just a chocolate cake, but our eyes are making a difference and influencing our taste since they see the red batter. When tried with eyes closed, it tastes just like ordinary chocolate cake. Silly, right? Today - Is it a classic or just a cheap trick? 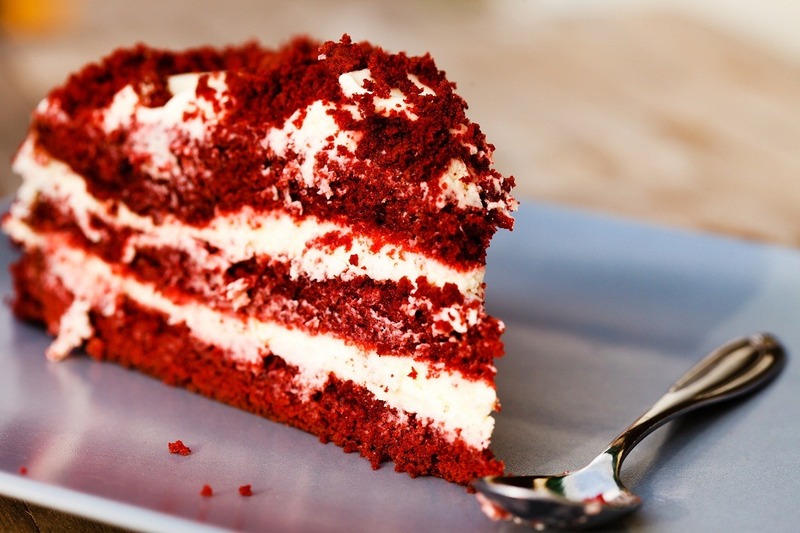 How to make the perfection called Red Velvet Cake? Red? Velvet? All are associations for love, jealousy, mellowness. Red velvet together? Well, that’s another story. It took hundreds of years of love, sweet joy and a bit of politics to get where red velvet cake is today. Cooks in the 18th century were making it just without coloring. 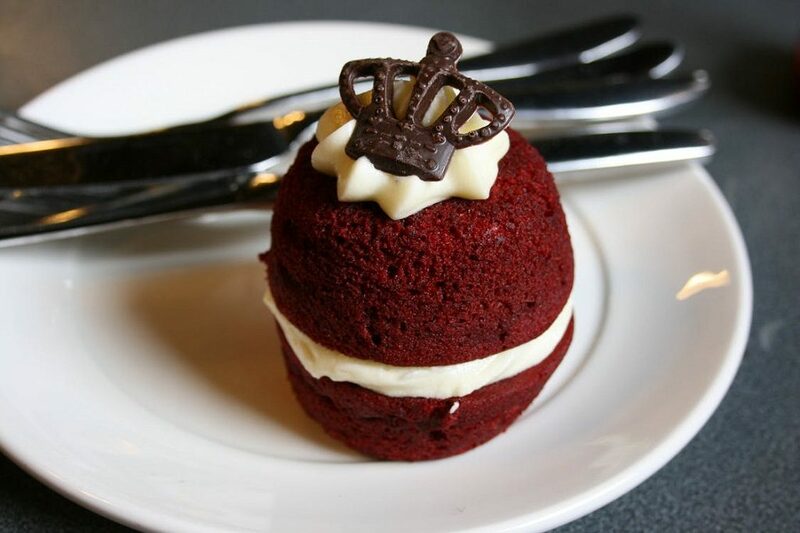 There is a legend according to which chef of Waldorf Astoria hotel in New York has made first red velvet cake as we know it today. It was so popular and quite expensive for the time that everyone was asking for a recipe. Finally, recipe leaked when a chef billed 350 USD for a recipe to a customer. Allegedly, the customer was so outraged that he sent the recipe to all of his friends. Even this sounds like a lovely legend; the truth is that original roots of red velvet cake are going back to 1800`s when first red velvet cake was made. At the time, at its beginnings, it was not red, but in a time they were adding beets to color it to red. Well, many would dispute today's red velvet cake is even close to the ones that have defined a path of this cake in last hundred years. We all see that it has become so popular (with good reason), but it went too far in some occasions – Dunkin Donuts have red velvet latte? Or I have seen in San Francisco that you can buy chicken that is soaked in red velvet cake batter? Today "red velvet taste" is promoted everywhere including industries that are not even connected to food. On the market, it is easy to find red velvet scented candle, red velvet vodka or even red velvet air freshener. Industry today has so much to do with "red velvet" brand, but this cake has quite honest roots. 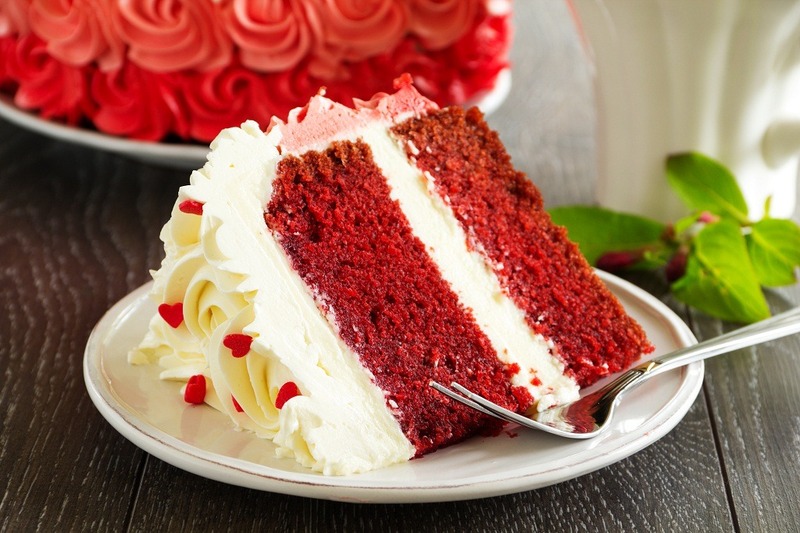 The great ascent of the popularity of red velvet cake started after Congress adopted new Food, Drug, and Cosmetic Act in 1938, which was supporting new regulations for food coloring. And so popular, red velvet cake was an excellent ground for the promotion of usage of artificial food coloring. We all love weddings, brides and the happiness that surrounds this type of occasions. 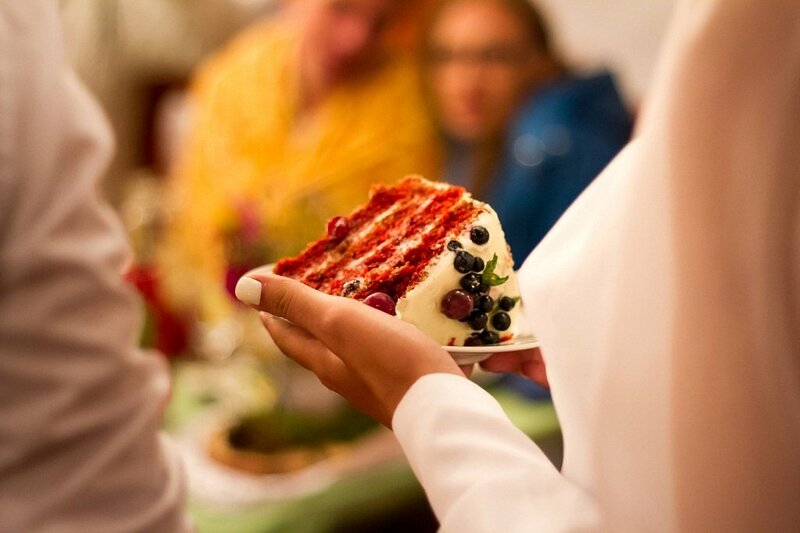 And if you want to make a wedding that is close to perfection, then the red velvet cake is inevitable. It is classy, stylish and looks great, just like a wedding is supposed to be. But try not to stick with weddings only; birthdays, anniversaries and other occasions that you want to be organized with style are perfect for red velvet cake. Making a red velvet cake is a challenge. Today there are so many different ways to make one. Event its true origins are not defined, its taste, smooth texture and rich, soft frosting make it one of the most popular cakes of all times. What do we need to make one? First, turn on the oven and set the temperature to 350F. Before making the cake mixture, prepare the baking pan by greasing it. It’s the best if you can use a rounded pan of 8 or 9 inches in diameter. For making a cake mixture, you need a large bowl in which you will put all ingredients. Use an electric mixer or a blender to beat all the cake ingredients. It is advisable to use low speed for 30 seconds and then additional 2 minutes on medium speed. After the mixture is finished and the pan is ready, pour mixture into the pan and bake in preheated oven for 30 minutes. 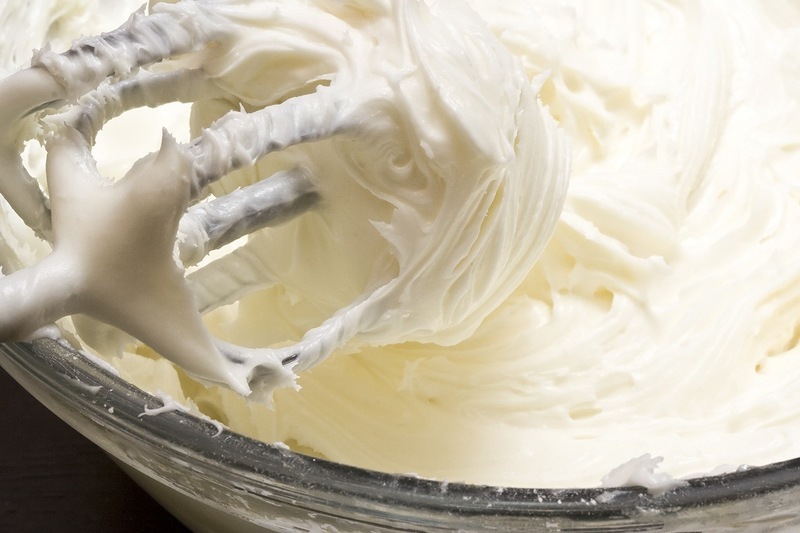 When making a frosting, first you mix a prepared butter and goat cream cheese substitute and blend them on medium speed. After this part is done, stop the blender and add vanilla extract and salt and beat the mass until it’s well-combined. The last step in the preparation of frosting would be to blend this mixture again, on low settings, and to add sugar in 4 batches, so it is blended well. Afterward, place it in the refrigerator for additional 10 minutes and your frosting is ready. 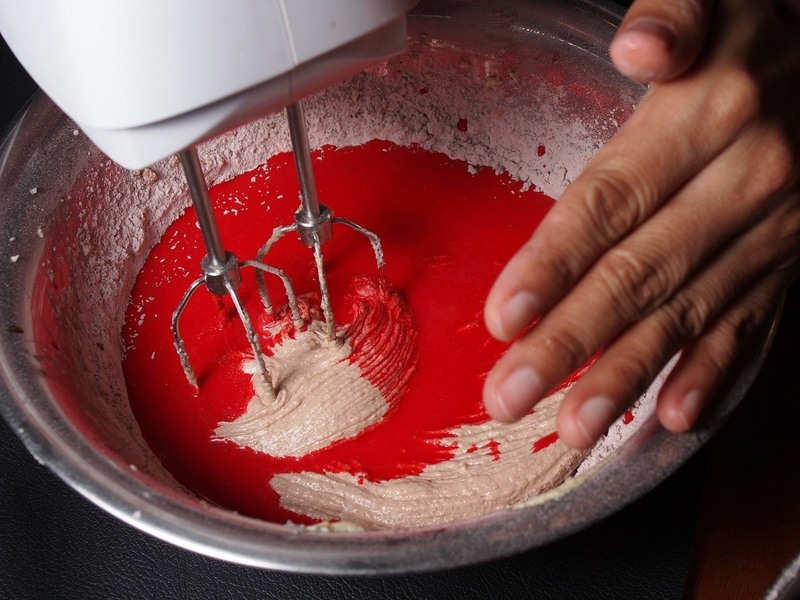 When frosting and cake mixture are ready, fill and frost the cake, using 1 cup of frosting between layers. When done, store in the refrigerator before serving. Village Bakery and Cafe Los Angeles – fascinating shape, has a swirl of traditional cheese frosting on top and a few sprinkles, just to make you happy. Duffs Cakemix – West Hollywood – large, soft pieces of red velvet cake, with traditional frosting on top but with added various fruits like strawberries. If you are more of a fan of cupcakes, they also have red velvet ones. Sweet Revenge Restaurant New York – They are offering a fruity version of a classic red velvet cake. Their version is a delicious red velvet cake, with crème cheese icing, cinnamon and topped with raspberry drizzle. This complexity of flavors makes this cake special. 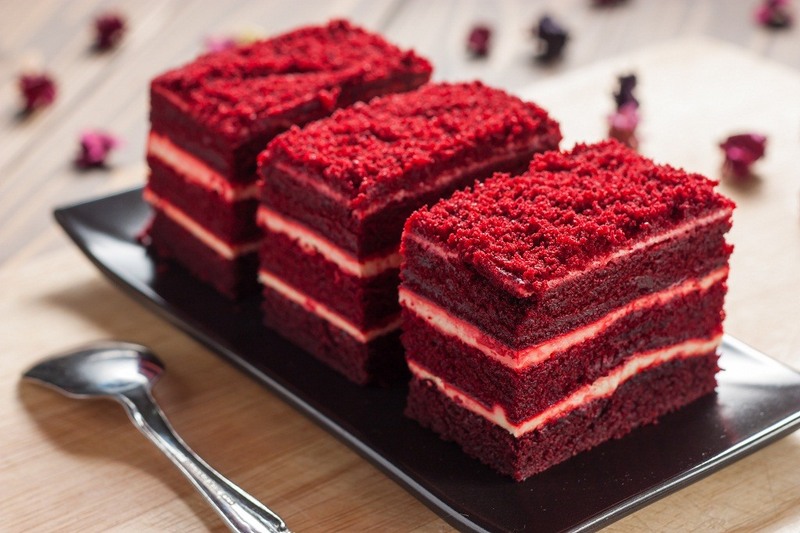 Pieces of Velvet Brooklyn – here you can find very traditional red velvet cake, but yet, if you would like to try something different, they are offering a variety of red velvet tastes, from the one with pineapple to the one with coconut. For sure, there are much more places in the US that can offer a variety of choices. If you like traditional red velvet cake more, maybe the best is to try to make it at your home and it will be as traditional as it can be. Or, if you like to experiment and enjoy various flavors, try to explore all the places around that are offering red velvet cake as it is so popular today. Either way, with red velvet cake, you’re going to enjoy!